Mama Nibbles: Kenny Chesney's NO SHOES NATION On Sale Now! Kenny Chesney's NO SHOES NATION On Sale Now! #ad I was sent tickets to help promote this show. Are you a country music fan and live in ‪#‎Michigan‬? 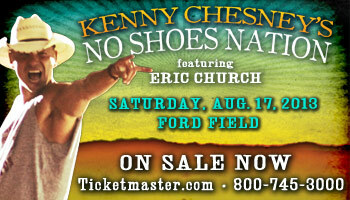 Kenny Chesney's NO SHOES NATION is on Sale Now with limited amount left for 8/17 Detroit Lions Ford Field. Along with Kenny Chesney, Eric Church, Eli Young Band and Kacey Musgraves will also be performing!